The words of Warren Moon carry tremendous weight. He's one of professional football's historic figures, both for his tremendous skill and his relevance as an African-American thrower. So when Moon speaks about quarterback Cam Newton people should listen. When Moon says what he did during an extensive conversation with CBSSports.com about Newton and race, more than a few will. Moon is Newton's adviser and prepared Newton for his combine workout in February. Since then, Moon has stayed in constant contact with Newton via text message and telephone conversations. Moon was extremely angry over what he perceives as racially biased treatment of Newton by media and fans and was impassioned in his defense of Newton. "A lot of the criticism he's receiving is unfortunate and racially based," Moon said. "I thought we were all past this. I don't see other quarterbacks in the draft being criticized by the media or fans about their smile or called a phony. He's being held to different standards from white quarterbacks. I thought we were past all this stuff about African-American quarterbacks, but I guess we're not. "Of course there is racism in every walk of society. We've made a lot of progress in this country. But racism is still there. I just thought in the sports arena we were beyond it. I think the way Cam is being treated shows we're not." Moon added: "The thing that makes me laugh is the question of can he [Newton] come out of the spread offense? Can he run a pro offense? Colt McCoy came out of the spread offense and very few people raised that issue about him. So did Sam Bradford. Same thing. Very few questions asking if Bradford could run a pro offense. Some of these questions about Cam are more about his intellect. It's blatant racism, some of it. "When I played I fought some of this. Guys like myself and Randall Cunningham, we were playing for a bigger calling. We were playing for guys like Cam and others. It's disappointing to see some of this stuff still exists. "There is no question," Moon added, "that African-American quarterbacks are in a better place. We've had black quarterbacks taken first overall recently like JaMarcus Russell ... Unfortunately, those players didn't have success. 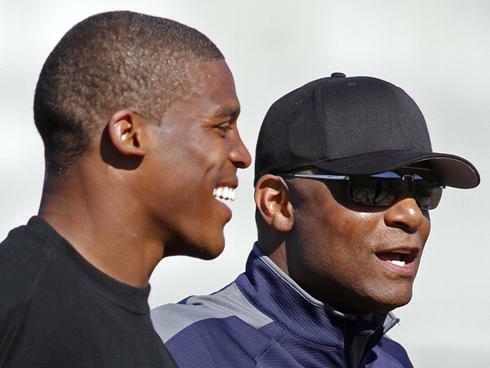 "One of the things that's happening with Cam is that he's being lumped in with them. It's not fair. They're all different guys." Moon explained he doesn't think NFL teams are discriminating against Newton. Moon is most troubled by the notion -- a notion that continues to grow -- that Newton is something he's not. To Moon, it's contrary to the Newton he knows. "You can't be fake and win a national championship," Moon said. "The players will see through it. He's won at every level. He took that Auburn team to the national title and that team wasn't as talented as some other teams in the SEC. "Just turn on the film and watch what he does on game day. Then if you have concerns just spend time with him. Go around the kid himself. Spend as much time as you need around him. You can only fake so much." Now, let the countdown begin for the media to strike back at Warren Moon and say that his assertions are completely unfounded and that the criticisms about Newton have absolutely nothing to do with race. They are going to parade around one of their token 'knee-groes' on TV and he (or she) are going to say how much they despise people 'playing the Race Card' when it comes to people criticizing them. I so can't wait. I can script this out myself because I know exactly what's going to be said. I've seen this dance enough times to know that the media doesn't take too kindly to being called out out on their race-baiting ways. So cheers to you, Mr. Moon, for stating the obvious, but I sure hope you have your armor on because you know the knives, bullets, and grenades are about to come out.